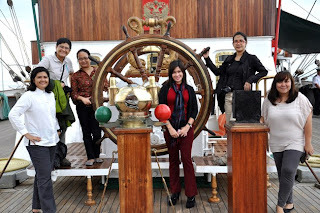 I was fortunate to be a part of Business Mirror's crew to step on board the famous Sedov, a Russian ship which was currently docked in Manila until January 12, 2012. And we were also the first ones being given permission to step foot and explore the ship. Yey! At first, everyone was just as apprehensive as I was because the crew manning the ship wouldn't let us through because the Captain was not on board. Uh oh! Luckily, JPS used his charm and we found ourselves going up the gangplank (stairs, or whatever they call it in ship-language) and met some of the crew and seeing the Captain eventually. Photo above was taken using my corby phone. We're not allowed to bring cameras except for JPS and AAC from the Philippines Graphic Magazine and Business Mirror. Even with the sails down, the Sedov was just as majestic as I imagined it to be. Its like looking at something that you only see in the movies or a picture book. I can visualize buccaneers that look like Jack Sparrow and Will Turner doing some crazy sword fight on top of the masts, hanging from the ropes and fighting the likes of Captain Hook and Davy Jones. 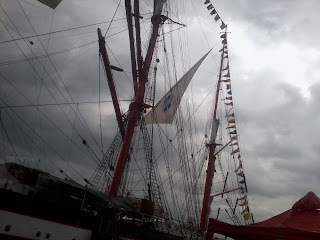 .. and going up and down the Sedov, checking the ropes, the helm, masts, and even finding the galley! Yes, I discovered the galley thanks to that delicious smelling potatoes. Above photo was taken by Joel Pablo Salud. That's us, at the helm. Read about the Sedov by Joel Pablo Salud, editor-in-chief of Philippines Graphic Magazine. Link here.